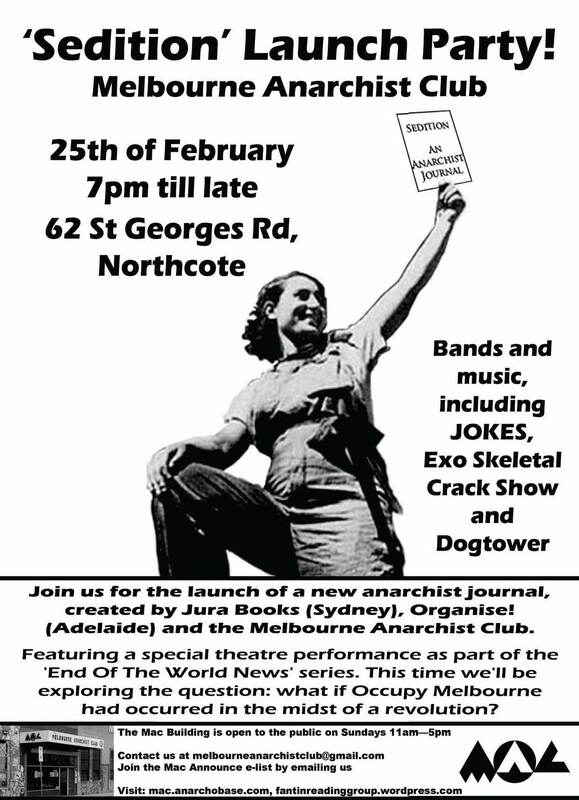 25 February, 7:00pm start @ Melbourne Anarchist Club: 62 St Georges Road Northcote. It's time to (briefly) hang up our activist cloaks and channel some of our revolutionary fervour into celebrating our exciting new collaborative anarchist publication - Sedition. As well as sparkly new copies of Sedition and the standard excellent company, we'll have bands and a special theatre performance as part of the 'End Of The World News' series. This time we'll be exploring (in an interactive fashion) the question: what if Occupy Melbourne had occurred in the midst of a revolution? Sedition is a mutual collaboration between three geographically disparate Australian anarchist collectives, the Melbourne Anarchist Club, the Jura collective from Sydney, and Organise�the Adelaide anarchist communist group. This project is a constructive medium for discussing the way forward for anarchist groups and anarchism in Australia, importantly�both in theory and praxis. We aim to establish better communication and organisational networks between our groups and to produce thought provoking literature that challenges the established order.